On February 2nd, 2019, for the occasion of the feast of the Presentation of the Lord to the Temple, His Holiness Patriarch Mor Ignatius Aphrem II celebrated the Holy Qurobo at St. Georges Patriarchal Cathedral in Bab Touma, Damascus. He was assisted by His Eminence Mor Dionysius Jean Kawak, Patriarchal Vicar in the Archdiocese of the Eastern United States of America. In his sermon, His Holiness spoke about the roots in the Old Testament of the act of presentation to the temple of the firstborns. He also talked about the fulfillment of God’s promises, and recalled the story of Simon the elder. 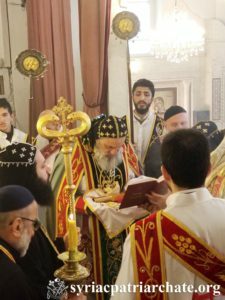 During the Qurobo, His Holiness presided over the rite of blessing the candles according to the tradition of the Syriac OrthodoX Church of Antioch.